Summer is here which means we have wonderful warm weather to enjoy! And we don’t know about you, but most children absolutely love water play. The interesting thing about water play is it can inspire loud, splashy, active fun but it can also calm hot, bothered, grumpy kids (and adults). It is almost a therapeutic activity and one where young children can happily play for an extended time, side by side, without much fuss. Water play comes in many forms, whether this is in the bath, a water table, the pool or simply splashing out the back with some buckets or tubs of water. It can be done solo or with friends. It can be indoors or outdoors. 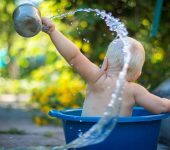 And it’s not just the entertainment factor that I love about water play, it also has many important development benefits that cover different key areas to help with children starting school. For instance, did you know that when children repeat actions over and over, they are mastering new skills and strengthening neural pathways? It’s incredible what children can learn through play. Here are some of the other great benefits from letting your kids splash around. Water play gives many opportunities to develop gross and fine motor skills across the age ranges. Young babies love to reach out when water is being poured in front of them, they love to feel the trickle and try to grab the flowing water with an eager grasping hand. 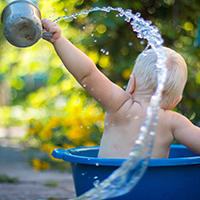 Young children use their large muscles when paddling in pools, running through sprinklers, or as they lift buckets, fill them, empty them and clean up spills. Not only does this build their strength and endurance, it also stimulates an internal body sense called proprioception which is important for awareness of body position and movement and is essential for developing coordination skills. They develop their small hand muscles when they squeeze bottles, liquid droppers, or wring out sponges and when they scoop, pour, stir and scrub. They also refine hand eye coordination skills with these tasks. Painting the fence or paving with a paintbrush and small bucket of water helps develop young children’s fine motor skills ready for later writing development. Water play is an open ended activity, which allows children to make discoveries and explore outcomes. Simple things like watching objects sink or float develops problem solving skills as they begin to learn why and how things happen. Discovering different temperatures such as warm or cold, or observing water absorption or evaporation are also part of of learning early science concepts. Exploring water flow, movement and splashes is physics. Dissolving soap or dirt in water is chemistry. Different size and shape containers help develop maths concepts of measurement, size and volume, full and empty. You can also talk to children about which objects are big, bigger or biggest, short or tall, small or smallest. Through this repetitive exploration children are learning basic maths and science which will help them to better understand these concepts later in the classroom. Water play can be an avenue for children to go from playing alongside each other to playing cooperatively together. It’s a helpful way for young children to become aware of others playing nearby and it can also be the simple act of filling up buckets together with cups or following ideas or starting to join in on what others are doing. Which makes it a perfect activity for home or playgroup. These actions may seem simple but are all important steps to help with developing skills for building friendships. As parents we know that having conversations with our children encourages language development. The more conversational turns a child gets the stronger their language skills grow! Through water play there are many opportunities to build on this. Using specific words particularly for abstract concepts e.g. sink, float, squirt, dissolve, saturated, evaporate, more, less, biggest, smallest etc. helps build a wider vocabulary. Knowledge of a wide variety of these words helps children with later reading comprehension and gives them background knowledge they will need for science and maths. Even if children are playing by themselves, they often love to narrate what they are doing which is great practice for building sentences and placing words together. Water play is so versatile, you can pretty much bring in whatever toys you like such as dolls, dinosaurs, cars for a car wash, sponges, bubbles, funnels, tea sets, jugs, sticks, gumnuts etc. – it really is an open-ended activity with endless possibilities! There really is no right way or wrong way to play with water and no finished product that needs to look a particular way. All of this provides invaluable play experiences that will help to encourage a child’s imagination and creativity. As mentioned above, water play really is versatile so regularly changing the activity or objects will ensure your children will get the most out of it. Here are some suggestions for some water play fun! Plastic tubs are inexpensive and great for smaller areas, fill them with sponges or containers and watch the creativity flow! Try adding ice or even have things frozen in the ice cubes! Experiment with salt shakers or string. Safety: Supervision is essential at all times. Remember to empty out water or ice at the end of the activity.